Höschl C.: "Bendu", Last word - Lidové noviny, Nov. 20,1996, p.. 20. Höschl C.: "Touched with fire". A chapter in the book "Miloš Kopecký - Myself". Eminent publishing, Prague 1996, edited by Pavel Kovář. ISBN 80-85876-29-9. Höschl C.: "Lunar phases and climatic mysteries". Vesmír, 75, 1996, 12:688. Höschl C.: "Memory to pioneer of psychiatric genetics". Vesmír, 75, 1996, 12:709. Höschl C.: An interview with Prof. Norman Sartorius for Lidové noviny daily. (LN, Nov. 7, 1996, p. 5.). Vita Nostra Revue 1/97, p. 14-22. Höschl C.: Evakuace Prahy. (Evacuation of Prague). Poslední slovo (Last word). Lidové noviny, 3.2.1996. Dnes odpovídá Cyril Höschl (Today answers...) "Vánoční kometa", LN, 21.2.1996,p.10. Dnes odpovídá Cyril Höschl (Today answers...) "Pilulky se nebojme". LN, 26.4.1996,p.11. Höschl C.: "Člověk a akt volby". LN 130/1996, p. 7 (4.6.1996). "World summit of deans and experts on health and medical education" - Argentina, Buenos Aires, Sept.3,-9., 1996). Vita Nostra Revue, 3/96, p. 5-16. Höschl C.: "Žežulka z Plačkova" ("Siskin from Weepshire"), Last word - Lidové noviny, 4.9.1996, s.. 16. Elections for Senate - Praha 8: Cyril Höschl (ODA) - Stanislav Křeček (ČSSD). Mladá Fronta Dnes - supplement "Praha", page 2, 24. 10. 1996. "Voyage to Argentina" (parts of the professor Höschl's report from a business trip; edited by the board of journal Forum). Forum, roč. III, č. 4, 18.11.1996, str. 14. Höschl C.: "A dog can change your life". Náš pes, 1/1997, p. 8-10. Höschl C.: "Touched with fire. Normal and pathological mood." Vesmír 76, 1997: 125-128. Höschl C.: "Diligence, thoughtfulness and rebellion of inferiority". University News (Brno), 4, 1997, 2:30-32. Höschl C.: "Is our fate in stars?" Nová přítomnost, 4/97, kp. 28-29. Höschl C.: "Address on the occasion of 25. Anniversary of the Institute of Physiology and Clinical Physiology of 3rd Medical Faculty, ChUP of Prague and 135. Anniversary of the building Ke Karlovu 4". Čs. fyziol. 46, 1997, 2: 83. Höschl C.: "Sole administrative stimulation is not good enough". Lidové noviny, June 5, 1997, p. 5. Klaus V., Höschl C.: "Is economy a behavioural science? ", Vesmír 76, 1997;6:333-337. Höschl C.: "Transformation of R & D - Czech experiences". Science, technology, society 6, 1997, 1: 65-76. "Friday men" (interview). Magazine "slovo na víkend", Aug. 29, 1997, p. 10. "Can we still laugh?". Magazine "Slovo", Aug, 30, 1997, p. 6-7. Höschl C.: Blues and jolly of my days (feuilleton). Forum: 4, 1/1997, p. 12. Klaus V., Höschl C.: "Is economy behavioral science?" (dialogue). A chapter in book: Klaus V.: The defense of forgotten ideas. Academie Prague 1997, pp. 413-445. ISBN 80-200-0645-1. Höschl C.: What is Schizophrenia? Remedia populi 1,1997,9: 33-36. Höschl C.: New curriculum starts. Forum, 4, 4/1997, str. 8-9. Lidové noviny daily, Public poll, appendix "Czech Republic in the time of crisis and unstability". Dec. 3, 1997, p. III. Searching for juridical advice. Letter to the editor, Lidové noviny daily. December 16, 1997, p. 10. Höschl C.: Foreword. In: Duin N., Sutcliff J.: History of medicine. Czech translation A. Hradilek. Slovart, Praha 1997, 256 s. ISBN-80-85871-04-1. Klaus V., Höschl C.: "Is economy behavioral science? ", Vita Nostra Revue 1/97, p. 60-79. "Höschl C.: ""Life-events - milestones of our lives". Lidové noviny daily, 7.8.1997, str. 9. Höschl C.: In memoriam Viktor Höschl. Vesmír 76, 11, str. 644. Interview in Magazine Slovo. December 13, 1998, p. 8-9. Non-authorized transcription of the dialogue on the occasion of "Intelligibility Awards" of the journal Vesmír. Vesmír 77, 1998, 1 (appendix): p. IV. Interview for Medical News: Medical curriculum did not reflect the progress in medicine in 20th century. Zdravotnické noviny, 47, 5/1998, str. 16. Höschl C.: New medical curriculum-international perspective. Forum 4; 6/1998:3. Interview for "Ekonom" (Good sound and old customs). "Ekonom", weekly of Business news. XVII, 17/1998, p. 10-12. ISSN 1210-0714. Psychiatric diseases: to be not only tolerated by society, but also sheltered. Interview for series on the Czech medicine. Weekly Týden, 10/98, p. 64-75. What is Cyril Höschla wondering? MF Dnes, Víkend II, August 27, 1998. What is Cyril Höschla wondering? MF Dnes, Víkend II, September 19, 1998. Secrets of human soul - depression and anxiety (an edited record of radio discussion). Remedia Populi 9, 1998: 26-32. What is Cyril Höschla wondering? MF Dnes, Víkend II, October 17, 1998. Höschl C.: Is an education sufficient defence against xenophobia? In: Czech Xenophobia, Votobia, Praha-Olomouc 1998, s. 66-72. ISBN 80-7220-044-5. Höschl C.: "Again we feel ashamed for our politicians". MFDnes, 29 December 1998, p. 12. Höschl C.: "I promise to stop tomorrow…! A promise to start since tomorrow…!". 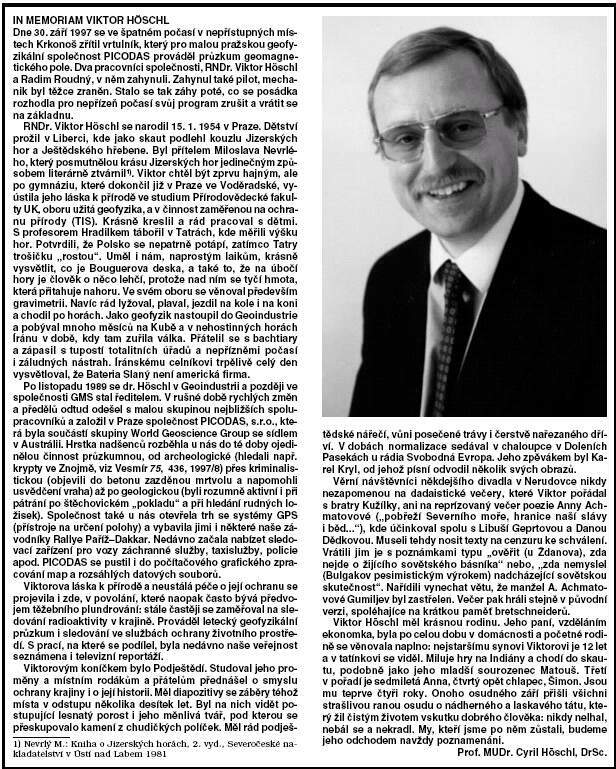 Zemské noviny (Country News), 31 December 1998, p. 6. ISSN 1210-7492. Participation in the inquiry of Mladá fronta daily - magazine Weekend: "Vhed did I cry last time?". MFD 18.4.1998, str. IX. "Czechs of 20th Century - Josef Švejcar". A contribution to the special supplement of Lidové noviny. LN, 26.5.1998, p. 8 S.
"What is Cyril Höschl wondering?" MF Dnes, Víkend II, July 25,1998. "What is Cyril Höschl wondering?" MF Dnes, Víkend II, June 27,1998. Höschl C.: Insulin for the soul: how to keep addicts somewhere between narcosis and abstinence. Zemské noviny (Country newspaper) 10/8/1998:6. Höschl C.: Hypocrisy and moral are indivisible phenomena: Mass danger for ethical upbringing of children? Zemské noviny (Country news), 16.9.1998:6, ISSN 1210-7492. What is Cyril Höschl wondering? MF Dnes, Víkend III, 14. 11. 1998. What is Cyril Höschl wondering? MF Dnes, Víkend III, 12.12. 1998. Höschl C.: We live by small ideas disregarding great ones. MF Dnes, March 9, 1999, p. 14. "What is Cyril Höschl wondering ? ". MF Dnes, Víkend III, April 3, 1999. Höschl C.: Contribution to the topic "Czech low self-esteem (comeback of democracy discovers substantial weekness of our character)" Týden (The week), 15/1999, str. 44-51, April 6, 1999. ISSN 1210-9940. Teleconference Prague-Boston (and three questions to Deputy-Dean). An interview in Vita Nostra Revue 1/1999, p. 42-45. "What is Cyril Höschl wondering ? ". MF Dnes, Víkend II, May 15, 1999. Vědecký život v paneláku aneb když podlaha není vidět (Scientific life in a panel-house). Interview with prof. Cyril Höschl on housing. Podlahy od A do Z, 1, 1999, 2: 32-33. ISSN 1212-4737. "What is Cyril Höschl wondering ?". MF Dnes, Víkend II, June 12, 1999. "What is Cyril Höschl wondering ?". MF Dnes, Víkend II, July 17, 1999. What is the gratest scientific discovery in 20 th century and in the millenium? Answer in the public inquiry, Lidové noviny 176/99, July 31, 1999, p. 18. Answer to inquiry "What citation norm do you use?". Kompas, the catalogue of medical literature, 2, 1999, 4:7. What is Cyril Höschl wondering?. MF Dnes, Víkend III, August 14, 1999. Hőschl C.: Open society and singing International. Lidové noviny, p. 11, August 16, 1999. Höschl C.: Point of view - Stability may precede degeneration. Lidové noviny, August 30, 1999, p. 1 & 10. "What is Cyril Höschl wondering?". MF Dnes, Víkend II, September4, 1999. Höschl C.: Natural science and humanities: two worlds? Vesmír 1999, 9:487-491. Höschl C.: Discussion on article Natural science and humanities: two Worlds? Vesmír 78, 1999, 12:683-685, authors resposponse on p. 685. What is Cyril Höschl wondering?. MF Dnes, Víkend II, October 2, 1999. Höschl C.: Can fidelity be implanted? Lidové noviny, October 2, 1999, pp. 1 and 10. Is the current democratic system failing?. Prof. C. Höschl in Radioforum on intellectuals, politics, corruption, and students. Vita Nostra Revue, 3/99, pp 41-44. What is Cyril Höschl wondering? MF Dnes, Víkend III, November 6, 1999. Höschl C.: Theory of Depression. Vesmír, 78, 1999, 11:607-611. "What is Cyril Höschl wondering ?". MF Dnes, Víkend III, December 11, 1999. Interview with Cyril Hőschl "Neither shaman nor pope". Reflex 52/1999, p. 18-20. What is Cyril Höschl wondering? MF Dnes, Víkend III, 9. 1. 1999. What is Cyril Höschl wondering? MF Dnes, Víkend III, 6. 2. 1999. What is Cyril Höschl wondering? MF Dnes, Víkend III, 6. 3. 1999. Höschl C.: What do we feel about the war in Yugoslavia and why?. Zemské noviny, p. 6, April 3, 1999. Höschl C.: Every fourth of us has contacted a psychiatrist at least once during a life. Zemské noviny, September 21, 1999, p. 7, and Slovo, September 21, 1999, p. 7. Höschl C.: "Ten years after the coup d’état: how do we feel and why?" Zemské noviny, November 18, 1999, p. 7. ISSN: 1210-7492. Slovo, November 18, 1999, p. 7, ISSN: 1211-6416. Response to inquiry "What is the meaning of last ten years for you and what is your hope for the year 2000?" Zdravá rodina (Healthy family journal), 12/1999, str. 4. "What is Cyril Höschl wondering ?". MF Dnes, Víkend III, January 15, 2000. Höschl C.: Point of view – Unsatisfied is better than indolence. Lidové noviny daily, January 15, 2000, p 1 and 10. Höschl C.: " Can we teach genes to sing ? " Interview for mazazine of Bohemia Daily " Top magazín na Víkend ". January 22, 2000, p 12-13. ISSN 1212-4591. Höschl C.: What is hysteria? Vlasta magazine, 8/2000, p. 39. "What is Cyril Höschl wondering ?". MF Dnes, Víkend III, February 26, 2000. Höschl C.: Point of view – Research and education is neglected. Lidové noviny daily, No.52/2000, March 2,1000, pgs. 1 and 11. Common school adventure. Inverview with Cyril Höschl ". Magazine " Přítomnost, 3/2000, pp. 10-14. What is Cyril Höschl wondering?. MFDnes, Víkend III, March 18, 2000.